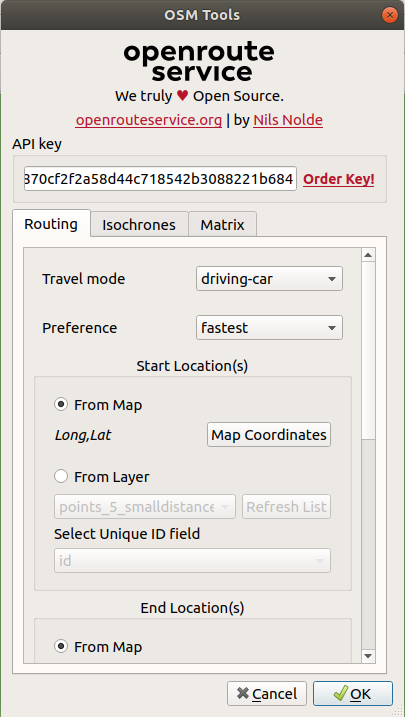 We’re pleased to announce the next version of our QGIS plugin to access the most popular functions of openrouteservice. in QGIS. OSM Tools is the only QGIS plugin to access advanced features like dynamic routing, isochrones or origin-destination matrices with a few mouse clicks. You can choose to either use point layers from your QGIS project or choose a point dynamically from the map. If the request was successful, a new layer will be created with extensive attributes set.You can use the configuration file at $PLUGIN_HOME/config.yml to use higher request limits or even another base url if you’re hosting your own version of openrouteservice. In an upcoming version, we’ll add support for integration into QGIS Processing module, so that it will be possible to use our APIs in the model builder. See the project homepage here, together with the issue tracker.